70 Servings EXCLUSIVE BONUS SIZE! Glutamine is the most abundant single amino acid in the body and it is considered to be conditionally essential during times when the body is undergoing large amounts of stress (ex: heavy exercise). Glutamine supplementation may support the removal of waste products in the body, and improve digestion and immune system function. 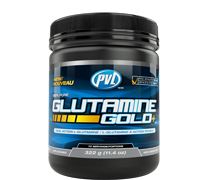 Glutamine PLUS+ also includes L-alanyl-L-glutamine, a unique fully-bonded dipeptide that combines the amino acids L-Alanine and L-Glutamine to help your body rehydrate, replenish and recover. L-alanyl-L-glutamine’s stable and ultra-pure dipeptide structure is quickly and easily absorbed by the body, and has been shown to help improve hydration over water alone, and has also been shown to absorb better by as much as 224%. The combined effect gives the user a one-two absorption effect over and above what plain L-glutamine alone can deliver. 1. Harris, RC, et al., NBH: L-glutamine absorption is enhanced after ingestion of L-alanylglutamine compared with the free amino acid or wheat protein. Nutr Res 2012, doi:10.1016/j.nutres.2013.02.003. 2. McCormack WP et. al. Effect of acute L-Alanyl-L-Glutamine and electrolyte ingestion on cognitive function and reaction time following endurance exercise. J Am Coll Nutr. (Published online June 22, 2015). 3. Hoffman, JR, et al., L-alanyl-L-glutamine ingestion maintains performance during a competitive basketball game. Jrnl Int Soc Sports Nutr 2012, doi:10.1186/1550-2783-9-4.